True to its name, the Great Wall of China is a mammoth-sized wall stretching over thousands of miles. It is made of bricks, stones, wood, and tamped earth. This article is all about Great Wall of China. The Wall runs from east all the way to the west, along the historical northern borders of China. It’s not actually a single wall but a series of fortifications originally meant to protect Chinese states from the attack of nomadic groups of the Eurasian Steppe. The Great Wall took centuries to complete and quite many number of dynasties contributed to the building of a rare man-made monument. Previously it was known as the Ten-Thousand Mile Long Wall. 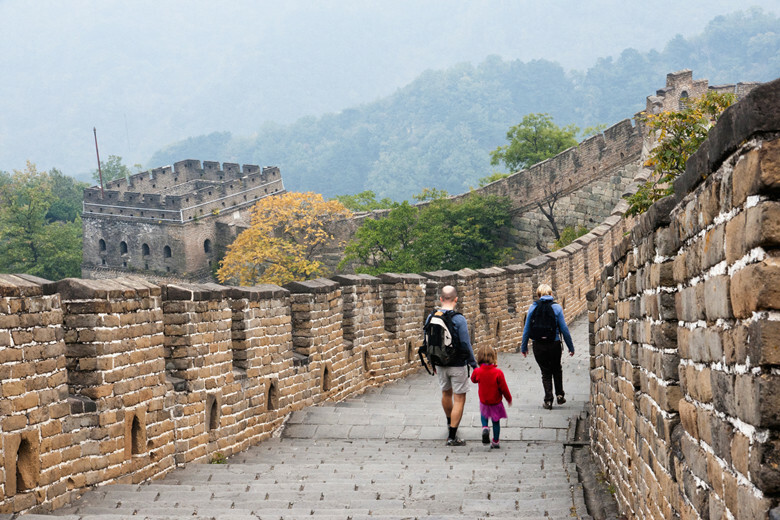 Let us now dive deep into the most interesting Great Wall of China facts for kids. The history of the Great Wall of China goes back to many centuries. It all started when the first emperor of China, Qin Shi Huang committed to protect his Qin Dynasty from nomads’ invasion. The Qin Dynasty began somewhere in between 221 and 206 BC. 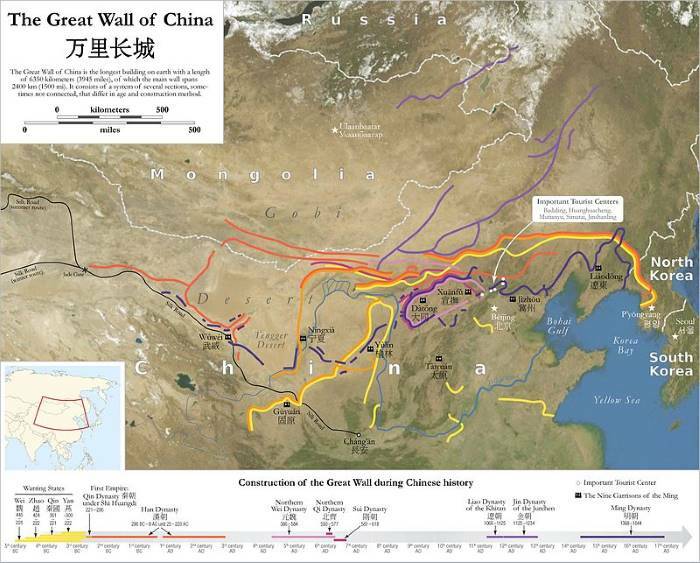 Qin started building walls that would run along Gansu to the end of southern Manchuria. Later dynasties such as Northern Qi (550 – 574), Ming (1369 – 1644), and Sui (589 – 618) also renovated and expanded the walls to protect their respective kingdoms. The Northern Qi dynasty built around 900 miles of new walls. The Sui Dynasty built hired one million labors to build walls. The Song Dynasty (960 – 1279), Qing Dynasty (1644-1911), Tang Dynasty (618 – 907), and Yuan Dynasty (1271 – 1368) contributed nothing whatsoever in further building the walls. The Great Wall didn’t turn out to be just as effective as enemies successfully marched through the gates of Shanhai Pass in 1644. 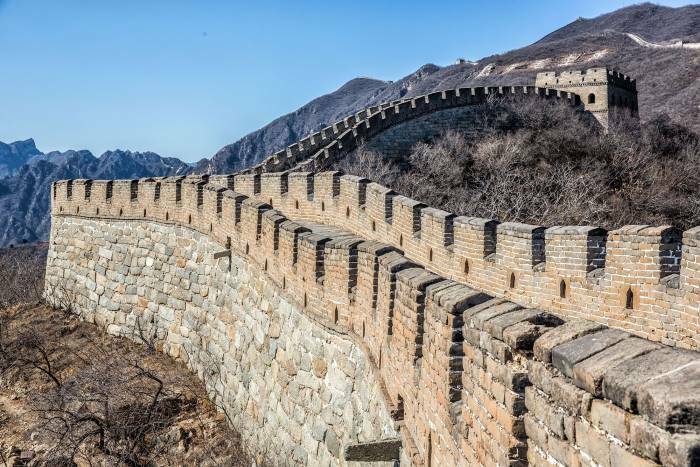 The present-day Wall owes much of its construction to the Ming Dynasty which didn’t only build the wall with bricks and stones; he also extended it through the rough terrains. The Great Wall was started in 221 BC during the reign of Qin Dynasty. Many dynasties followed the Qin in completing the Wall. The main purpose of the wall was to protect the Chinese dynasties from the invasion of nomads coming from the European Steppes. The Qin dynasty was highly committed to unite all parts into a single empire. How was the Great Wall of China Built? Most of the workforce consisted of convicts and soldiers that were forced to build the wall. The Emperor Qin Shi Huang ordered the convicts to participate in the construction of the wall. About 400,000 labors died during the construction of the Wall. Many soldiers were buried within the wall itself. The first of the Chinese emperors Qi Shi Huang built the Great Wall of China. The Qi dynasty lasts 221 to 206 BC however he couldn’t complete the construction during his reign. Where is the Great Wall of China Located? The Great Wall is located in Huairou, China. It runs all along the Northern parts of China—covering east to west while stretching more than 3,000 miles. One of the most significant portions of the Great Wall is a Ming Great Wall which is 25 feet and 7 inches in height. The Great Wall of China length is estimated at 21,196 kilometers. The width of the Wall is about 9.1 m (29 ft 10 in). How Long to Build Great Wall of China? It took 2,000 years to complete the Great Wall. The Ming Great Wall was complete in 200 years. How Long would it take you to Walk the Great Wall of China? It would take around 540 days to walk the Great Wall. How Many Bricks were used in the Construction of Great Wall of China? According to a rough estimate, around 3,873,000,000 individual bricks were used in the Wall. Great Wall of China from Space? It’s not possible the photograph the entire Great Wall from the Earth. Luckily, however one can see the Wall from the space. (I don’t suppose you to get to the space for that..lolz). The portion of the wall that runs through the desert measuring 435 miles west of Beijing is seen from the photographs released by NASA. What Year was the Great Wall of China Built? The Great Wall had begun its construction during the Warring States period ranging from 475 to 221 BC and Spring and Autumn from 771 – 476 BC. The then Emperor Qin wanted to join all the states of China. The Great Wall is all made up of a variety of materials but it generally depends on the era. During ancient time, people used rammed earth and stones as a building material. However in the Ming dynasty, they started using bricks, lime, tiles, and stones. Their work had become easier with the invention of bricks. The bricks were not only smaller, they were quite lighter in weight in comparison to the stones. As it turned out, the construction took the pace. The gateways and foundations are particularly made up of stones that are cut in a rectangular shape. The ancient builders also used wooden gates which were meant to trap enemies. At the inner surface of the walls, they built stables and barracks. What is the Great Wall of China used for Today? Unlike in ancient times, the Great Wall is used today merely to attract visitors around the world. Everyone who comes to Beijing prefers to have a look at the Wall. How Many Kilometers is the Great Wall of China? The Wall is estimated at 21,196 kilometers in length. How Effective was the Great Wall of China? It won’t be wrong if we assume that the Great Wall wasn’t turned out just as effective as it thought to be. In 1644 the Manchu invaded and got through the wall quite successfully. Who Started the Great Wall of China? The first Emperor of China, Qi Shi Huang started the construction of the Wall. Much of the construction was later done by the Ming Dynasty. The western side of the Ming Great Wall touches the Jiayu Pass in the Gansu province. The Yang and Yumen Passes on the western side are pretty difficult to trace. As the Wall begins at Jiayu Pass, it runs all the way across Hexi Corridor, through the Ningxia desert. From the desert the Great Wall enters the loop of Yinchuan. Some of the first walls that were renovated during the Ming dynasty believed to run across the Ordos Desert. At Piantou Pass, the Wall splits into two portions: Outer Great Wall and the Inner Great Wall. It then runs through the Pingxing Pass and Yanmen Pass covering as much as 250 miles. Some of the most visited and newly built sections of the wall occur in Beijing. They are pretty famous too. The most popular stretch of the wall is Badaling Great Wall located near Zhangjiakou. It is probably the first section to be opened to the visitors in China. The Badaling Great Wall is 7.8 meters high with its width measuring at 5 meters. The Ming Great Wall is by far the most outstanding section in that it climbs sharply in Jinshanling. The Ming Wall stretches 7 miles in length but the height is estimated at 16 feet and 5 inches to 26 feet and 3 inches. The total length of the Ming Wall is about 8,850 km (5,500 mi). According to archaeologists, the length was taken using advanced technologies. The entire length comprises 3,889 miles of actual wall; about 1,387 miles of rivers or hills; and 223 miles of trenches. The entire length of the Great Wall of China is about 13,171 miles or 21,196 kilometers. How Many People built the Great Wall of China? Studies suggest that as many as 300,000 soldiers and 500,000 people participated in the construction of the Great Wall. About 400,000 people were killed during the construction. How Many Miles is the Great Wall of China? The length of the Great Wall is 13,171 in miles. What is the Great Wall of China Made of? Ancient people had used just about any material available to them. When there were no bricks, they used woods, stones, and tamped earth to build the wall. Some other materials included sanded reeds, juniper tamarisks, crude stones, and solid blocks. How Tall is the Great Wall of China? The overall height of the wall is about 25 feet and 7 inches. The Great Wall of China ends on the Shanhai Pass also called the Shanhaiguan. The Old Dragon’s Head leads to the Bohai Sea. It is located in Qinhuandao, Hebei. How Much Did the Great Wall of China Cost? While we do not know the precise amount spent on building the Wall, the close guess is that each mile cost about 1 to 5 million dollars. In that case, if we calculate the total cost of the Great Wall, that’ll be around $13 billion to $65 billion. Is the Great Wall of China Still Standing? Yes, the Great Wall is not only pretty much standing, it’s also being renovated from time to time. Each year, hundreds and thousands of visitors pay a visit to the Great Wall. How Old is the Great Wall of China? The Great Wall of China is about 2,300 years old.